If you are looking for an original gift and a great hobby, a bee house would be a something to put on your list. It is easy to raise solitary bees and a fun hobby with the benefits of increased pollination in your garden. Declining populations of bees has been linked to climate change. Bees not only produce honey but also pollinate so that plant species can thrive. The mason bee, unlike the honey bee, is solitary which means that every female is fertile and makes its own nest. 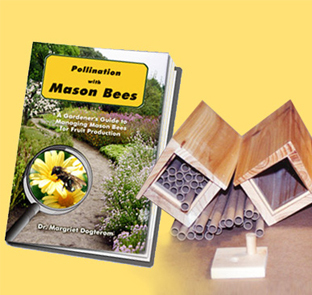 Mason bees do not produce honey or beeswax and are immune from mites. With no honey to defend, they do not sting unless stepped on or squeezed and so make great “garden pets” because they pollinate fruit trees and shrubs and are safe for children and pets. BeeDiverse Bee Houses are durable, attractive, easy-to-clean and made from sustainable resources to last many summers. So if your are looking for a great gift for a gardener, consider a BeeDiverse Bee House. Check out the several varieties to get someone started on a great new hobby. Are you getting ready for winter? If you are in an area that receives a fair amount of snow, you really should consider a Sno Wovel. Clear the snow away with much less effort than snow shoveling. And do so without causing any pollution! The Sno Wovel: One of the things I like best about my job is finding new machines which do their job and have little impact on the environment. The Sno Wovel is designed to clear snow in an energy efficient manner….but most of all it is so back-saving and ergonomic you really have to try it to understand. Clears away snow 3x FASTER than a snow shovel and is an economical, eco-friendly alternative to snow plows and snow blowers. First we read about the Sno Wovel; next we watched videos about it and saw it in use; then we had to wait for our demo machine to arrive. My son and I were excited when it arrived and took it into the house to assemble. It took about 45 minutes to get it together. We had fun playing around with it but really wanted and needed some snow to test it. We didn’t have to wait long, six inches of wet snow had dropped over the night. I got the Sno Wovel out of the garage and went to work. At first using it seemed ungainly. But after 15 minutes, I began to understand how to use it better. After 20 minutes our driveway was just about clear from snow. Normally, this would have taken my son and I about 90 minutes to clear with wide shovels resulting in a least one sore back. In addition to taking less time, my back had not been affected at all. The Sno Wovel had passed the first test. In subsequent uses in 4” of snow, chipping 2”of packed ice, and dealing with a blizzard, the Sno Wovel continued to efficiently clear the snow and ice and did so without any back pain for Dad. The Sno Wovel is a great tool for removing snow. It is the people powered snow blower! As temperatures drop and daylight savings time has come and gone, minds wander to thoughts of sitting in front of a warm fire with a good book . Here are some tips for a safe and warm winter. Burn only dry, well-seasoned wood that has been split properly. Properly seasoned wood is darker, has cracks in the end grain, and sounds hollow when smacked against another piece of wood. Build hot fires. A smoldering fire is not a safe or efficient fire. Regularly remove ashes into a metal container with a cover. Store the container of ashes outdoors on a cement or brick slab (not on a wood deck or near wood). Keep a fire extinguisher handy.Chopping wood can be one of life’s most enjoyable tasks. There is an art to woodsplitting and using the proper tools is important. It is also critical to keep your woodpile dry, bug free and protected. 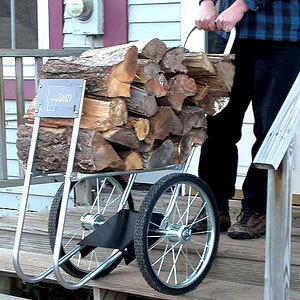 To make hauling your cut wood easier on your back, the Super Chuck Log Carrier is only 24″ wide, and able to fit through interior doors and has a 20″ wheel handle that makes it easy to navigate through rough terrain. Water and Mowers: Water and mowers are not a good mix. Whether your mower is a manual mower or a powered mower, water should not be used for cleaning. Just had an email from a customer who recently purchased a Brill Razorcut 38. She mentioned that she had just hosed down her mower. 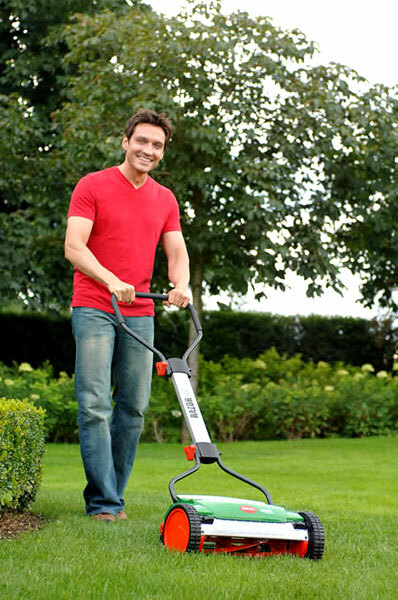 ﻿﻿﻿Silicone Spray and Mowers: Silicone Spray and mowers are a great mix. Before mowing, spray the blades with Silicone Spray. When you are done mowing wipe the blades clean with a rag. Spraying first, cleaning last, will keep your mower going strong for many years. Silicone Spray can be purchased at the hardware store, it is right next to the WD-40. 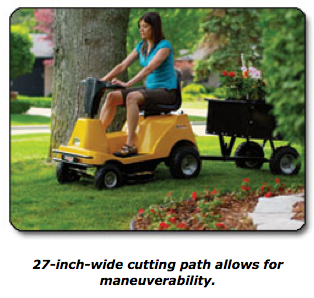 Exciting news: The Recharge Mower company will offer a commercial mower in 2011. The Commercial unit will be powered by Lithium Ion batteries. The batteries will power the unit for about 4 hours. With the purchase of a second set of batteries, you can replace the first battery with the second and operate your machine for 8 hours. Excellent Customer Service: Equally exciting is that the same wonderful customer service available to Recharge Mower owners will be available to the commercial owners as well. Your city or town’s mowing needs: In the spring of 2011, your town could be using these fine machines and reducing their carbon footprint. Just think no more gas, oil, spark plugs and service needed to run their machines. Man’s best friend can wreak havoc on the environment. If you have a dog, think about alternatives to “curbside” toilets and consider the many ways you can help minimize the impact of dumping dog poop. In NYC, a very dog-friendly place, fines of up to $1,000 are assessed upon owners who don’t scoop the poop, and most people abide. In addition to cleaning up after your dog, if you live in an urban area, consider using a biodegradable bag, which unlike plastic, will not take years to decompose. And if you have a large yard, you can put dog poop in worm farms (but use the compost in your flower garden but not on your vegetables), or install a doggy loo, basically a bucket with holes in the bottom which you place into the ground on a bed of stone and you add an enzyme to break down the poop. When the bucket is full, you simply pour water into it and the broken down materials will flush away. 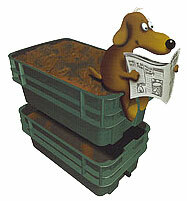 There’s no risk to your plants, you can have the bucket hidden away in your garden. Bag bagging those leaves and try composting them- it’s not so difficult. Here are ten tips for composting leaves. Leaf composting creates leaf mold, which is a soil conditioner. Leaf mold used in your garden also increases water retention of soils.